Aaron Hotchner: . Jack won best costume's at school. Jennifer Jareau: Nice! What was he? Aaron Hotchner: Yes, we absolutely should! Season 10 was very much mixed in quality, very like much of the period from Season 6 onward, but although there were less than good episodes there were also good and more ones. "Boxed In" is very like "Anonymous", in that it is neither among the best or worst of Season 10 but overall is somewhat middle of the road. Nothing comes over disastrously, but something is missing as well. "Boxed In" is not quite as good as the terrifying "Mr Scratch", the poignant and harrowing "Nelson's Sparrow", the creepy and powerful "The Forever People", the tense "Rock Creek Park" and the unconventional but extremely well done "A Thousand Suns". On the other hand, it's significantly better than the likes of the strange and not in a good way "If the Shoe Fits", the poor "Breath Play", the very unbalanced in writing "Protection", the wastes of good ideas "Hashtag", "The Boys of Sudworth Place", the disappointing "Beyond Borders" and the similarly unbalanced in writing "Scream". Despite that it could have been better, "Boxed In" does have many great merits. Visually, as always, the production values are without complaint. It's very well shot and lit and is overall stylish, gritty, classy and atmospheric. The music is moody in the haunting and melancholic sense and fits well, without either enhancing or distracting from it. As ever, the acting is very good. Of the leads, Joe Mantegna and Thomas Gibson have the lion's share and both men do splendidly. In support, Pamela Reed gives one of the season's most outstanding supporting turns. There are some delightful character moments here with the team, and the interaction is adorable. The whole Hotch and Jack subplot is enough to make the hearts melt in its cuteness and charm, especially the conversation with JJ about costumes and the sweet touch with Jack at the end. 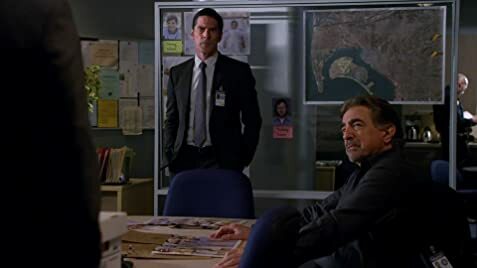 Hotch and Garcia's first scene is reminiscent of prime 'Criminal Minds', primarily with Garcia being much closer to the ray of sunshine than the annoying and melodramatic caricature that she became in some of the latter season episodes. The scene with Hotch and Madam Bouvier is fun, as was the Darth Vader imitation. Rossi as ever proves to be a real scene-stealer, he isn't considered The King of Sass for nothing, he has the best lines of the episode, and the best of them are priceless, especially the lines regarding the solitary confinement, taking what psychos say with a pinch of salt and his response to the man complaining about his house being egged. Jessica is a very nice character. However, was mixed on the case. There is no denying that parts are disturbing and emotionally powerful and that the twist regarding the unsub's father was a very neat touch. It also does a great job showing the contrast between dysfunctional and healthy families and is very truthful in what it says about abusive parents begetting abusive children. It is a little lacking in tension and suspense, and can be very predictable and with not enough of how the team solve the case. The unsub, who generally actually was pretty interesting, gives up far too easily. While nowhere near as badly as in "Scream" and "Protection", both of which were woefully unbalanced in who and what to focus on, the team screen time is not very balanced. There is nowhere near enough of Reid and Garcia, and there could have been less of JJ, didn't mind at all about it being Rossi and Hotch oriented because they are such great characters (Rossi is one of the main reasons why the show is still stuck with by me despite it being past its glory days). "Boxed In" is yet another good example of why Kate mostly leaves me cold, she is a rather bland character who doesn't gel with the team (feeling out of place, same with Jennifer Love Hewitt's acting) and she has a tendency to be unnecessarily rude here which is off-putting.